Meet the newcomer to our iconic A5 family. The first-ever 2018 Audi A5 Sportback features an elongated power dome hood that bows to the powerful engine below, while its newly available sleek sportback body expresses a strong shoulder line and powerful silhouette. 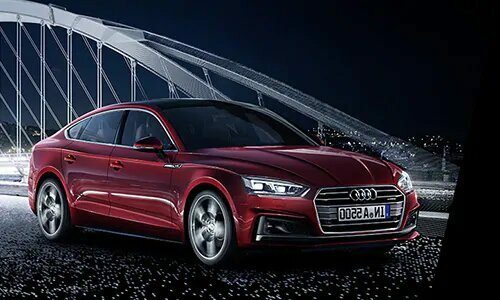 The classic coupé elements that are brought over from the exisitng A5 family will be sure to turn heads wherever you go. Heads will turn, and hearts will follow. 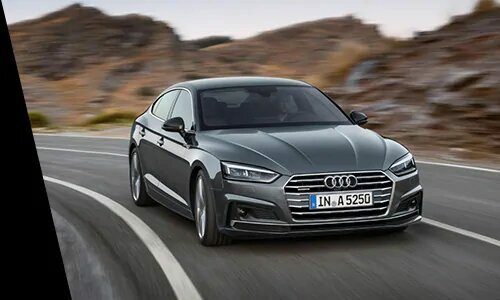 The first-ever A5 Sportback features iconic lines which extended over the hood and along the body with the wider singleframe grille showcased at the front. Accentuated wheel arches with a sharper wave shoulder line provide a powerful stance. Heartstrings will be tugged courtesy of the dynamic edge on the tailgate and Slimline 3D LED taillights. What is style without substance? Behind the elegant lines of the Audi A5 Sportback lies an exceptional chassis featuring lightweight construction, intelligent quattro all-wheel drive, sophisticated suspension and efficient TFSI engines. The new 2018 Sportback 2.0T engine offers 252-hp, 273 lb-ft of torque and boasts an impressive 0 to 60 time of just 5.7 seconds. The engine is paired with a seven-speed S-tronic gearbox and quattro all-wheel drive which provides an exhilarating drive on any road condition. The 2018 A5 Sportback boasts impressive and futuristic new technology to improve the experience while in the cockpit and behind the driver's seat. The newly available MMI® touch technology with handwriting-recognition allows the operator to navigate the system by writing their inquiry rather than picking numbers or letters or by moving their finger across the touchpad to more easily navigate the maps. The integrated 12.3-inch, entirely digital, instrument cluster offers classic and infotainment modes, with Google Earth™ and Google Street View ™. On the road, anything can happen. The advanced driver assistance technologies courtesy of the Audi Suite in the 2018 A5 Sportback can help you foresee some of the most unpredictable obstacles to come your way. Radar sensors and optical warnings in the Rear Cross Traffic Assist system alert of impending cars and can even support the driver in stopping the vehicle. Audi pre sense® city warns the driver of an imminent collision with stationary or cornering pedestrians and vehicles at speeds up to 52 mph. The impressive system can even initiate emergency braking if the driver is too slow to react.